Want french fries just the way you like them and homemade donuts that are delicious and easy? Then a deep fryer is just the appliance you need for your kitchen collection. There are a ton of available options out there, but not all fryers are created equal! To help you choose the right fryer to invest in, we have put together this comprehensive deep fryer frying guide with everything you need to know to make a quick, smart choice. 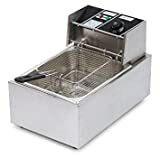 Stove Top Deep Fryers: Varying in size, stove top deep fryers can fry up anything from fried chicken to crispy nuggets, depending on the model you go with. As they use your stove for a heat source, you don’t have to worry about having enough outlets or counter space to run these convenient cookers. 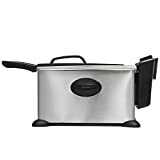 Countertop Deep Fryers: Almost always electrically powered, countertop deep fryers are compact enough to fit on a kitchen counter and act as an independent appliance. 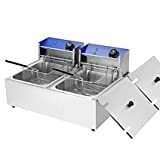 Freestanding Deep Fryers: These are larger fryers that can be powered by gas or electricity and are used to fry up larger things. Often referred to as a turkey fryer, they are ideal for Thanksgiving fry ups or cooking a feast for a larger family. 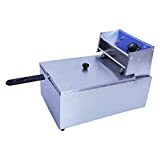 Funnel Cake Fryers: Specifically designed to fry funnel cakes, these fryers are wider, shallow tanks. Useful for homemade donuts as well, they will save you oil and are ideal for people who frequently make either. Pressure Fryers: Frying in a pressurized fryer will mean the same crispness but in much less time. Perfect for cooking things like turkeys and chicken that would otherwise take much longer to fry, they are an efficient kitchen addition. 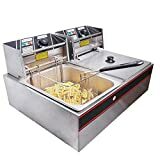 Ventless/Rotary Countertop Fryers: These fryers spin food while it is being cooked, making it possible to cook with less oil. As such, they are a healthier option to frying without losing that authentic fried taste. Oil-less Fryers: Using halogen heat, convection, and/or infrared technology, these fryers make all of the crunch with none of the oil. They are easy to clean as there is no messy oil cleanup, and are a good alternative to cooking those crispy foods you like when trying to cut back on oil. Cleaning: Fryers that are easy to clean are the most appreciated fryers online, and units that have dishwashable parts are reviewed as the easiest to clean. Paying a little more for this feature and/or stainless steels and non-stick interiors will mean a lot less hassle. Filtering: Owners rate fryers higher if their oil and odor filters work well, and much lower if they don’t. Good filtering makes it easier to keep oil clean and keeps oily cooking smells contained. If this is a concern for you, compare fryer filtering features and look for top brands with good filtering reviews. Controls: Overall, reviewers prefer digital controls over dials as they feel the fryer is more trustworthy and accurate when it comes to temperature. This tends to be a personal choice, so choosing between dials and digital should be based on budget and preference to ensure product satisfaction. 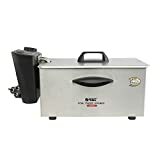 Operation: Owners of fryers that are easy to assemble and take apart, are simple to use, and that have good clear instructions rate their fryers much higher. Choosing a good quality name brand can go a long way toward preventing complicated instructions and buyers remorse. 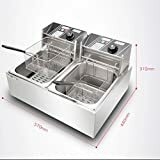 When choosing the size of your fryer, think about how many people you will be cooking for, what kinds of things you would like to fry, and how frequently you will be using it. Four-cup fryers fry up servings for two, a 6-cup fryer can cook up to 4 servings, and a 12-cup fryer can fit an entire bird. Know your baskets! Smaller countertop fryers have one basket. Larger units will offer multiple baskets that will allow you to fry two or more types of food, in one tank, at the same time. Rotating fryers have baskets that rotate, which uses less oil. 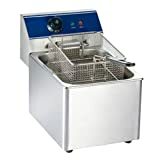 And funnel cake fryers often include flipping baskets ideal for cakes and donuts. Adjustable temperature settings for more control and recipe flexibility. Hooks for draining that allow users to hang baskets to drain most of the oil before serving. A non-stick coated interior, dishwasher safe parts, and stainless steel baskets for easier cleaning. Built-in drainage and filtering systems making it easier to store and reuse oil. Multiple frying tanks so that you can fry different types of things at the same time using different oil and therefore resulting in better flavor. Auto shut-off timers will switch off the appliance when the cooking complete. The higher the wattage of an electric fryer, the more powerful the heating element will be. This means quick heating up and longer sustaining of optimal frying temperatures. When it comes to safety, there are some features you shouldn’t compromise on. Deeper tanks, lockable lids, or both on a fryer mean less splatters, and breakaway power cords will prevent big accidents if the fryer is bumped, as the cord will detach when pulled. Presto: Formed in 1905, Presto went on to invent the first saucepan style pressure cooker, putting them at the forefront of the kitchen appliance industry. Today, they continue to produce innovative kitchen appliances, including fryers, and are synonymous with quality. Waring: Waring introduced the first blender in America and after 75 years they ares still one of the top appliance manufacturers. Waring Commercial consists of high-performance, large-volume food processors and blenders, heavy-duty heating appliances such as grills, griddles, toasters and deep fryers, and a variety of other specialty products. Emeril: Designed by Emeril Lagasse, a world renowned culinary genius and master chef, the Emeril line is aimed at supplying quality home appliance products for the home. T-fal: T-Fal was formed in 1954 and created the first non-stick frying pan. Through the years, T-Fal has grown into one of the world’s leaders in quality, non-stick cookware that is available in over 120 countries.